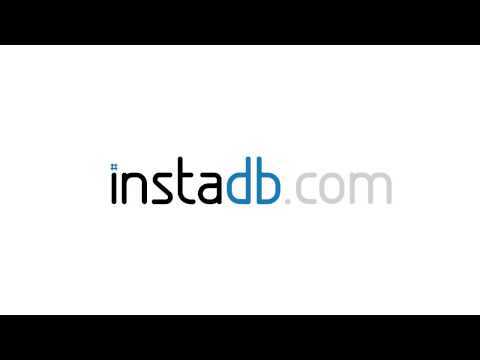 InstaDB is a low-level and low-code online database applications generator. The solution provides organizations with various built-in tools which can be applied to a vast range of situations, allowing users to build the database they need. The development platform can be used in simple, one table projects, as well as in large enterprise systems with hundreds of tables and thousands of users. The most commonly created applications are workflows, task managers and registers, but InstaDB can also be applied to a variety of new use cases. The platform is designed for users who understand concepts of relational database design, but can also be used by individuals with little to no technical background. InstaDB offers many functionalities and features which are available out of the box, in any table created. Every column added to a table within InstaDB is automatically accessible in the table filters allowing for advanced filtering functionality. Users can compose several filters to sort records in a hierarchical order, and show, hide, and change the order of columns. A pivots generator can be used in every table and view. InstaDB allows organizations to import and export data to and from spreadsheets, and automatically checks whether formats are correct and referenced records exist in the database. File attachments are displayed in the file column, enabling the downloading of multiple files. Users can organize table columns into sections called ‘groups’, and invite other users to a database by typing an email and selecting a set of roles. Time Tracking Storage Management Easy to export to Excel Stability SpeedStability - I've been using it for years with no problems. Security - it helps me keep track of time used for different projects, logged by different users. Everything is saved and can be retraced and checked. No chance to get the same level of confidence in a shared Excel file. Customizable - I was able to personally add additional fields to time tracking. For power users this system is very flexible. Does what it's supposed to do. Plain and simple. And it does it fast. Jira is nice, but is extremely slow. Whenever I have a choice, I prefer to use InstaDB. Stability - I've been using it for years with no problems. Security - it helps me keep track of time used for different projects, logged by different users. Everything is saved and can be retraced and checked. No chance to get the same level of confidence in a shared Excel file. Customizable - I was able to personally add additional fields to time tracking. For power users this system is very flexible. Does what it's supposed to do. Plain and simple. And it does it fast. Jira is nice, but is extremely slow. Whenever I have a choice, I prefer to use InstaDB. UI is plain - personally I like clean apps, but some folks might find it not as pretty. Non-programmers won't be able to fully utilize this software. That said it's still very useful to normal users. It facilitates the work of the entire therapeutic team, facilitates and accelerates the decision-making process in the care and treatment of our patients! It also makes it easy to count the working time of all employees and allows you to keep an electronic employee record.Very useful in the daily work, facilitates the transmission of information in a team, the whole team at one time has access to all the necessary information. Very useful in the daily work, facilitates the transmission of information in a team, the whole team at one time has access to all the necessary information. Configurability and wide range of possibilities. Just choosing column names and types gives you advanced reporting and filtering, export, management and many more capabilities that you would have to implement yourself if you used other products. Graphic design could be a little more modern and mobile-friendly, but it is a small issue that does not get in the way. maybe the the layout is a little bit "old fashion"
How does InstaDB compare with other IT Management apps? With InstaDB, users can build their own database applications even without having a technical background. Users can build tables and relations between them. The basic interface will be automatically created and can be modified later to better suit specific needs. Import data form Excel files and get them online, and export them back to Excel at any moment. InstaDB allows users to model workflows, create reports, design views and more. Invite other users to any application, and use access control mechanisms to limit user actions based on their groups assignment or other logic rules and record state. Below are some frequently asked questions for InstaDB. Q. What type of pricing plans does InstaDB offer? Q. Who are the typical users of InstaDB? Q. What languages does InstaDB support? Q. Does InstaDB support mobile devices? Q. Does InstaDB offer an API? No, InstaDB does not have an API available. Q. What other apps does InstaDB integrate with? Q. What level of support does InstaDB offer?